Home / 25th Mercedes-Benz Fashion Week Amsterdam / Elite Model Look 2016 Nederland / Fashion Week Amsterdam / program / Fashion Week Amsterdam announced program for the 25th edition! Fashion Week Netherlands announced the program for the summer edition of Mercedes-Benz Fashion Week Amsterdam, from the 1st until the 11th of July Amsterdam breathes fashion. Save the dates for the 25th edition of the biannual fashion week, all about young talent! The 25th edition kicks off on the 1st of July in the newest and most talked-about location for this moment; the A'DAM Tower. From Friday, July 1 to Sunday, July 3rd the Loft tower is transformed into a Dynamic Store, a pop-up store with clothes, shoes and accessories from designers who have shown during previous editions of Mercedes-Benz Fashion Week Amsterdam. In addition, there are inspiring lectures and presentations organized and the fashion-loving public can enjoy exhibitions of renowned Dutch designers. In the OFF SCHEDULE program are many other surprising fashion-related events held in various locations in the center of Amsterdam. One of the spearheads of Fashion Week Netherlands is to encourage young talent. The catwalk program of the 25th edition opens on Thursday, July 7th with Lichting 2016, the prestigious annual competition for graduate students from seven fashion academies found in the Netherlands. This edition Lichting celebrates its 10th anniversary with an opening show of the audience last year's winner, Karim Adduchi. 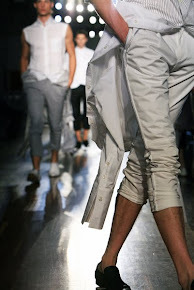 It is then for the 14 best fashion students from Netherlands to seduce the audience with their graduation collections. 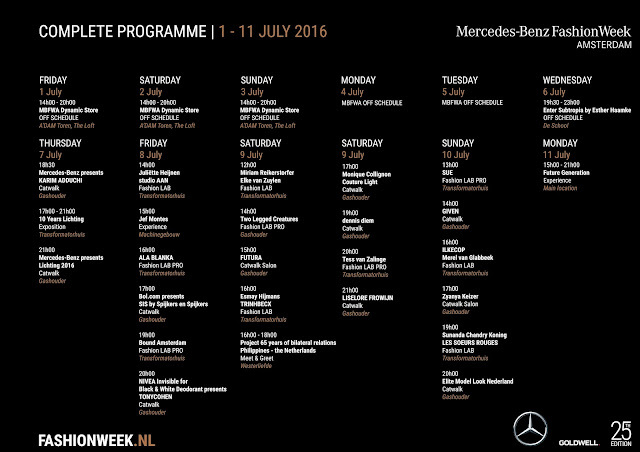 From Friday, July 8th until Monday, July 11th Mercedes-Benz Fashion Week Amsterdam offers 18 catwalk shows from advanced designers and young talent. Tony Cohen, Spijkers en Spijkers, FUTURA, Monique Collignon, dennis diem, Liselore Frowijn Zyanya Keizer will present their collections. Young fashion talents like Esmay Hijmans, Trinhbecx, BOUND AMSTERDAM, Sunanda King Souers LES ROUGES, Anbasja Whites and Tess Zalinge present their collection at FashionLAB. During the 25th edition of the biannual fashion week the national finals of the internationally renowned Elite Model Look Netherlands will take place!